The tour departs daily at 9am or 10am depending on tour company – Check your confirmation email for exact timing. Visit off-season to enjoy less crowded streets. Try to avoid a Sunday visit as the cathedrals and churches will be closed to visitors for services. We are comparing Avila and Segovia Tour Full-Day from Madrid Prices from leading ticket suppliers and Try to find you Cheap tickets prices on the market. Segovia is a historic Roman city with delightful narrow streets that your guide will show you around. The city has been declared a World Heritage Site and has a magnificent Roman Aqueduct that goes back to the times of Emperor Augustus. This aqueduct is said to be one of the best preserved monuments on the Iberian Peninsula. The city also contains a stunning Gothic Cathedral and the fairy tale fortress; the Alcazar castle which has also been used as state prison, college, and military academy. Avila is a medieval Spanish city and has also been declared a World Heritage Site. It still retains its fortified medieval city walls with towers which make it truly picturesque - The 2,500 metre long city walls are said to be the best preserved medieval walls in the whole of Europe. Avila is also the place where the first ever Spanish-Gothic cathedral was erected and it has the historically important Romanesque Basilica of San Vicente. It is also the birthplace of Saint Therese (Santa Teresa de Jesus), the writer of the Counter Reformation. The convent where she spent most of her life is open to visitors. Do this tour if you want an introduction to two historically important cities in the shortest amount of time possible. With the guided tours you will gain valuable information about both cities and the important historical sites that you otherwise might not learn about. A must-do for history and architecture fans. If you prefer to explore on your own, this tour is not right for you. Your Experience With Avila and Segovia Tour Full-Day from Madrid? Departing Madrid from a central location you will travel by air-conditioned bus to 2 World Heritage cities; Segovia and Avila. A knowledgeable bilingual guide will accompany you on the bus giving background information about the two cities and their rich cultural heritage. The first stop will be Avila, the delightfully picturesque walled city that is heaped in history. Here you will be guided through the narrow backstreets learning about the birthplace of Saint Therese as you pass by the convent. You'll also see Spain's first Gothic Cathedral and visit the Romanesque Basilica of San Vicente. 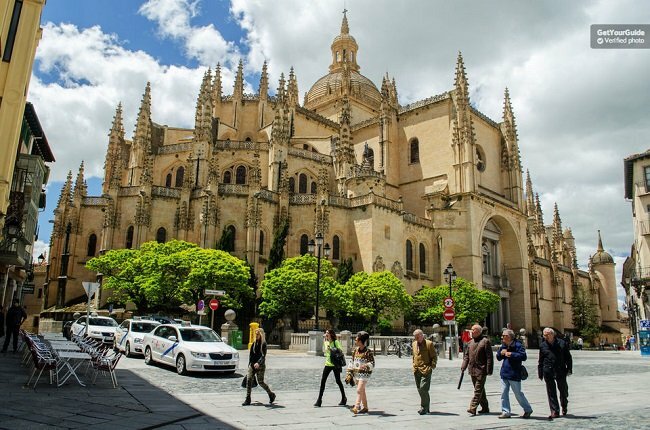 Next you will continue your journey to the historic city of Segovia where you will enjoy a guided tour around the streets, stopping off at the most important sites. You will see the impressive Roman Aqueduct of Segovia which is one of the best preserved monuments on the Iberian Peninsula. You will also visit the impressive Spanish Gothic cathedral and learn the history of the Alcázar, a fortress that has also been used as a royal palace, state prison, college, and military academy. You'll then get back on the bus and be returned to Madrid. What Avila and Segovia Tour Full-Day from Madrid Includes? A guided tour by coach to the historic UNESCO World Heritage cities of Segovia and Avila lasting 9 hours in total. Return travel to a central location in Madrid on an air-conditioned coach. A bilingual guide accompanying you on the coach and throughout all of the tour as you learn all about the history of these two cities and the top attractions that they hold. Fast-track entrance to the chosen attractions with your guide leading the way and informing you on everything you're about to see. When booking with Viator a typical Spanish tapa at lunchtime is included or, if you have instead opted for the lunch menu upgrade, you'll have several meal options to choose from including the chance to enjoy a typical Castilian meal. Hotel pick-up service may be available for selected hotels – Check with operator. Travelers Reviews about Avila and Segovia Tour Full-Day from Madrid? The majority of people talking about this tour on Viator, and Getyourguide are very pleased with the tour of Segovia and Avila saying they thoroughly enjoyed their day. People say this is an outstanding tour, very well organized, with a friendly driver and a friendly tour guide. They say that the architecture is breathtaking and highly recommend it others to do the trip. Travellers describe the tour as 'A Fabulous Guided Tour', 'A Day Well Spent' and 'A Great Experience and Great Value'. Some travellers note that most of the time is spent on the bus and that there's no time to explore the city streets on your own. Others say they did not know the tout would be bilingual and felt that precious time was lost due to having to go over everything in different languages – Separate language groups would have been preferred. Instant confirmation via email when you book online. Printed tickets and e-tickets are both accepted by your tour guide when you board the bus. Check the weather forecast for both cities to ensure you have the correct clothing with you – Both cities experience colder temperatures than Madrid. Pack some drinks and snacks. Where comfy shoes and don't forget the camera! Meet at a central Madrid location as advised by your booking company, unless a hotel pick-up has been agreed.